Creating purposeful assessments at the end of the year or during final exam time is a challenging task for novice advisers as well as those veterans. Want to give your students the opportunity to share their thinking process when creating spreads with their staff? Have your yearbook staff reflect on and present one of their spreads! 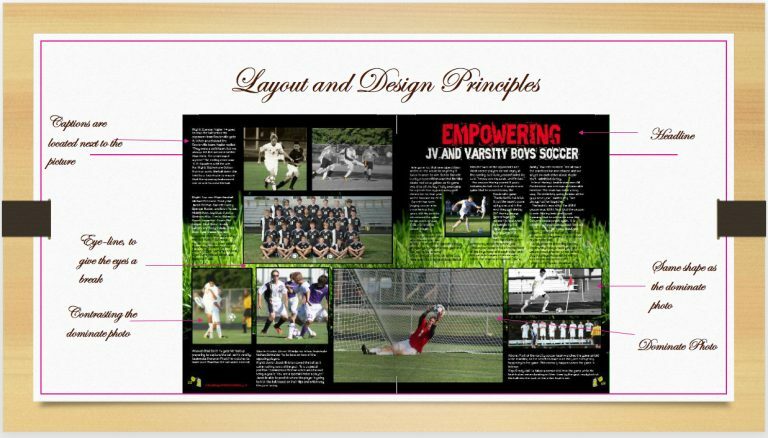 All yearbook staff members at Corunna High School create spreads for the yearbook; therefore, all yearbook staff members can display their hard work to their fellow classmates through an oral presentation. Oral presentation assessments are a meaningful way to have students showcase their thinking process, their learning, and their speaking skills. It’s also a great way to preview the yearbook while still in the production process. About five years ago, Corunna High School decided to give final exams worth 20% of each quarter’s grade. One of the main reasons I created the Oral Presentation Reflection assessment for yearbook students to do is because I had to have students earn 20% of their quarter’s grade in a practical and educational way. Students always need more practice speaking in front of others. A celebration of learning as an assessment is just the way to do just that. Each staff member selects a spread that they’ve created for this year’s yearbook and that they’re proud of. After students have selected their spreads, they will follow the outlined process. Please view the student assignment sheet I provide to students and the rubric on how I grade students. The students love to show off what hard work they’ve put into their best spreads to their classmates. Now it’s your turn to get that celebration started with your staff!